Herdsmen have again allegedly destroyed about 67 hectares of cassava plants belonging to ex-chief of Naval Staff, Vice-Admiral Samuel Afolayan in Kwara state. 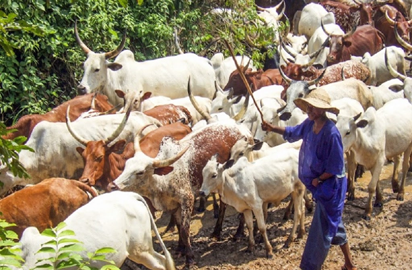 January this year, the ex-naval chief accused the herdsmen of destroying about 45 hectares of his farm land located at Obbo-Ile, Ekiti local government area of the state. He spoke with reporters in Obbo-Ile, describing the action as intentional. “After the earlier report, the situation as at now is that seven people are under arrest. They have caused more damages since after the burning of the first farm that was reported. They have burnt 50 hectares of palm tree carrying bunches. This is after the initial report,” he added. Admiral Afolayan said: “They have destroyed 67 hectares of cassava worth N57 million, they have destroyed four hectares of sweet corn ready for harvest valued at N2.5 million. I am still costing the palm trees because many of them may not survive. I am getting experts to quantify it knowing that palm trees can be harvested for 20 years. “I am also working on the valuation of the oranges they destroyed. Since after the first report, I have not gotten help from anybody (Federal and Kwara State Government) except the local government chairman that visited the farm and saw the extent of damages and expressed his opinion on what he saw. “Seven herdsmen have been arrested and handed over to police”. “The action has proved to be that it is a deliberate act now that I can trace their cows to their camps and that is why I conclude that somebody living a distance of between three and six kilometers go inside my farm, I believe it is intentional”.